Getting kids to learn outside the classroom is becoming increasingly important, as it has shown to have many benefits for children of all ages in regards to overall wellbeing and mental health. 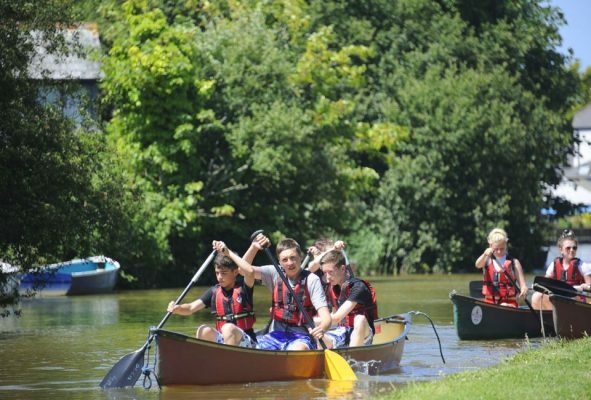 At Outdoor Adventure, our services for school residential trips are ideal for kids of all ages. Our operation is on the smaller scale and ensures that everyone involved in the school trips is getting the best team building opportunities available. Each pupil is guaranteed to have a fun-filled stay; one they won’t forget! The location of Outdoor Adventure plays an important role in the kids getting the most out of the residential trips. On the border of Cornwall and Devon, the spectacular scenery and inspiring locations are ideal for the fun activities we provide, from canoeing and kayaking to coasteering and abseiling. The provision for school residential trips which we offer includes curriculum-based programmes, covering subjects like geography, P.E. and Sports studies. We think it is important for kids to learn new skills away from the classroom, and the activities we do ensure great team building and personal gain. However, we never forget about keeping a sense of fun and excitement in all the activities we offer! The highly qualified and experienced instructors we have at Outdoor Adventure make sure all the pupils on the trip get the best out of it, and the personal touch we offer means each school trip can be tailored and provide flexibility for all involved. It is not just the outdoor activities that help with the pupils learning and growth, as we give them the chance to review their time on the trip, which helps them express their feelings and opinions and can open new doors in their future. Contact us now to find out more about the school residential trips and more which we offer at Outdoor Adventure.